I did have a feeling that we had once had a picture of a boxer as a Sepia Saturday theme, but after a quick check through the list produced by Kristin Cleage and Marilyn Brindley (and available via our wonderful Facebook Group) I must be mistaken. 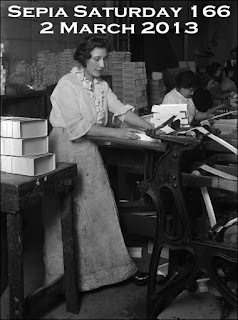 However, the boxer we have for Sepia Saturday 166 (post your posts on or around Saturday 2 March 2013) is of a different kind altogether because she is a worker in a factory making paper boxes. The photograph is by Lewis W Hine and comes from the George Eastman House Photography Collection which is available via Flickr Commons. Far be it from me to suggest theme interpretations to all the Sepians out there, but boxes, paper, workers, machines and dangerously long skirts spring to my mind. All you have to do is to select an old photograph or two and say a few things about them and if you can tie it in with your interpretation of the theme image, well that is a bonus. Post your posts, link it to the list below and then pop in and visit as many other Sepians as you can manage. Easy peasy! 167 : 9 March 2013 : Nominated by Sepian Kathy Matthews, this photograph might want to make you take a paddle steamer down a river ... or interpret the writing on the photograph itself. All that is for the future, for Sepia Saturday 166 all you need to do is to open up those cardboard boxes we all keep our old photographs in and search out a suitable contribution. And speaking of cardboard boxes, the shoebox full of old photographs has always been a favourite phrase of Sepian Peter Miebies of Peter's Blog. Peter has been in touch with us to say that he is taking break from Sepia Saturday to pursue some other interests. I always think that one of the fine things about the Sepia Community is that people can step in and step out when they want to and always be sure of a warm welcome back. So this is merely to say, "come back and see us when you can Peter, you will always be welcome here". Out theme image for Sepia Saturday 165 comes from the Flickr Commons collection of the Australian National Maritime Museum and is entitled "Group Portrait of an Unknown Family". 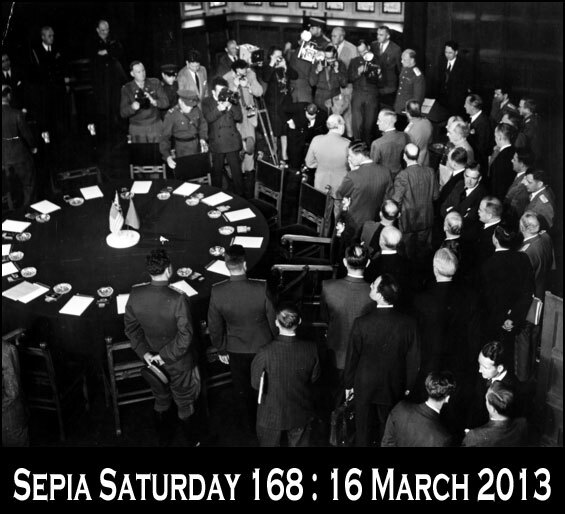 All lovers of old photographs are familiar with unknown people, unknown families and unknown places, we all have them in our collection, and Sepia Saturday 165 provides an opportunity to give them their moment in the limelight, not because of who they are but because of who they may be. 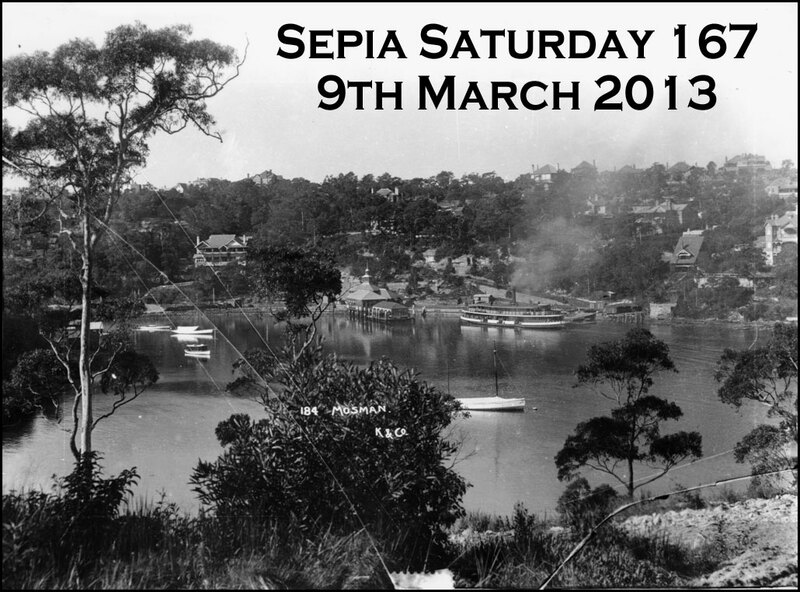 Just post your post on or around the 23rd February 2013, add a link to your post on the Linky List and don't forget to try and visit as many other Sepians as you can fit in. 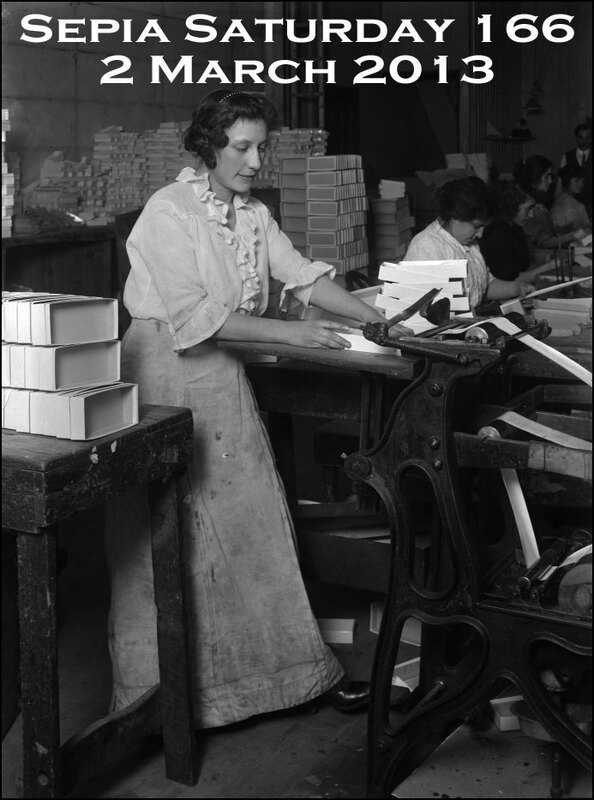 166 : 2 March 2013 : A photograph of a worker making paper boxes. You might want to go with workers, machines, paper or boxes ... or with whatever you can find in the picture. Please note that the theme image for SS167 was nominated by regular Sepian, Kathy Matthews. I would welcome suggestions for future image prompts from all Sepians, but remember, our prompts are images rather than subjects. Just send me a link to a suitable image : the only qualifications are that it should be copyright-free (either your own image or from one of the on-line copyright-free collections listed on our Facebook Group page and large enough to make a suitable web image (800 x 600 pixels or more). Let me have your suggestions either as comments on this blog or via our Facebook Group. Enough of all that : let us now turn our attentions to those we don't know. Who knows, someone out there might recognise them. It is our closest Sepia Saturday to St Valentine's Day, so what better prompt picture for Sepia Saturday 164 (post your posts on or around Saturday 16th February 2013) than a picture of ...... a tortoise. You might think it is strange the way the human mind works, but when I was young I was very fond of tortoises and turtles. So it turns out was Captain D Michelson of the Australian 2/2nd Battalion, for here we have a picture of him with the regimental mascot - Tim the turtle. The photograph dates back to March 1940 and forms part of the Australian War Memorial Collection on Flickr Commons. If you are looking for a theme for SS164 there are tortoises (or turtles), pipes, watches and all sorts of other things in this picture. You might also want to go with a wartime theme or a pet theme : or with whatever theme you want. Just post your old picture, say a little about it, and link the post to the list below. But before you race off to put your post for SS164 together, you may want to have a sneak preview of the next two theme prompts. 165 23 February 2013 : The photograph is called Group Portrait Of An Unknown Family. We all have some unknowns in our collections and this is their special week. Before I finish, can I take this opportunity of recommending a visit to our Sepia Saturday Facebook Group with its two new Joint Administrators - Ticklebear and Marilyn. Now back to this week. Make haste, don't be late, post your post for Sepia Saturday 164. When I chose the theme image for Sepia Saturday 163 a few weeks ago, we were still in midst of winter snow falls. And then the snow went away and I was left with a theme image that was becoming more unseasonable by the day. But as I put this post together, I look out of the window and the snow is falling once again - the Sepia Saturday weather forecast has got it right. Of course there is snow as a potential theme, but there are also lamp-posts, long coats and those ubiquitous barrels again. 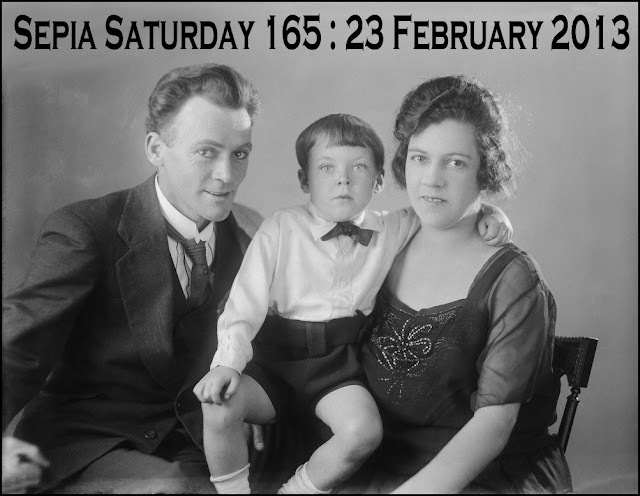 You can dig out whatever theme you like as long as you post your post on or around Saturday 9th February 2013 and add a link to it on the list below. And, don't forget, if snow isn't your thing you can let the theme melt away like a snowball in an oven and post any old picture you like. 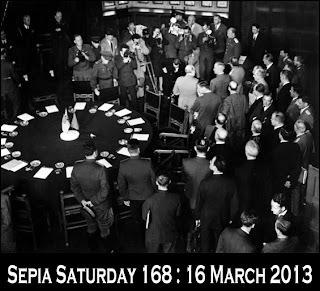 164 16 February 2013 : Let's slow things down to sepia speed. 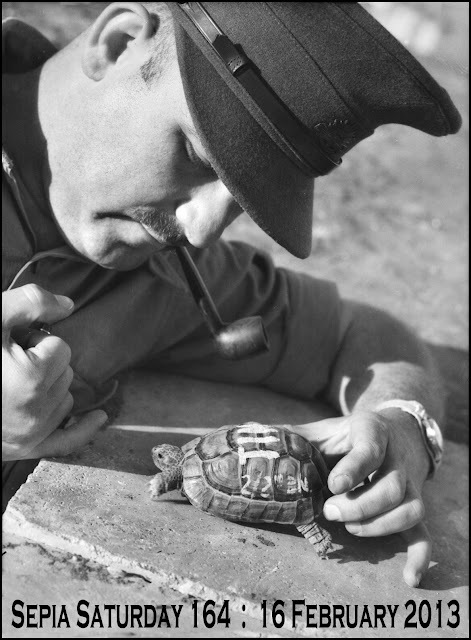 There are tortoises, pipes, watches and all sorts of other things in this picture. Such things are in the future, for the moment we are stuck in the snow. 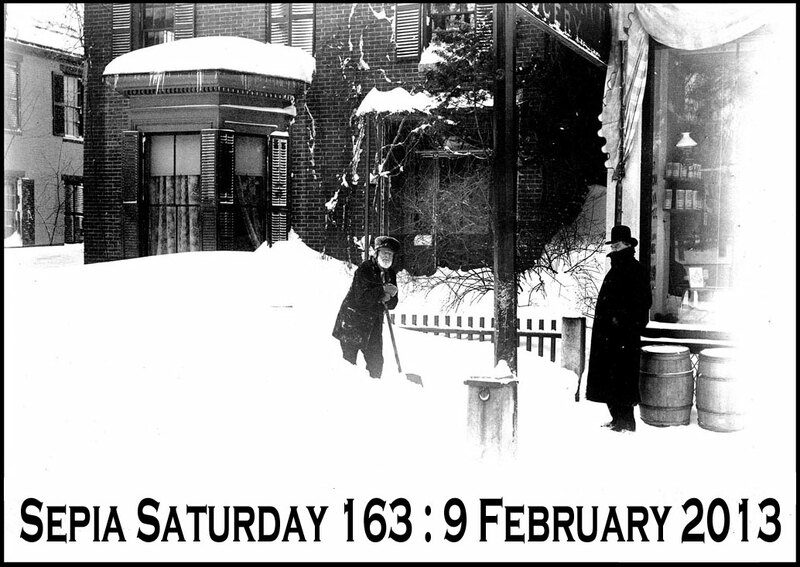 So get your snow shovels out and starting clearing a path to Sepia Saturday 163.